I’ve heard the question many times, but I’m not crazy about it, frankly. Living in a large Victorian with my 10-year-old daughter and two dead people who never took the hint—while also trying to make a go of the place as a guesthouse—is trying enough. But since Harbor Haven, New Jersey is a small shore town, and everybody knows all about everybody else, the question does come up. Usually, to be honest, I try to summon up an icy stare that makes the asker back down, but in this case, I did my best to force a small, knowing smile and nod. You had to be nice to Everett. Everett, as far as I could tell, was the only homeless man in Harbor Haven. He was, in his mid-fifties now, and never bothered anybody. It was rumored that he was a veteran of the first Iraq war, and post-military life had clearly not been kind to him. Even on this fine spring day, he was bundled up with clothing because he couldn’t afford to jettison anything that he wouldn’t be able to replace before winter. Everett was a beloved figure around town. In a community that liked to flaunt its concern for its own, Everett gave everyone an opportunity to show how understanding we could be; we out-kinded each other when dealing with him. There was a great deal of hypocrisy, of course, in how no one really ever tried to know him or trying to help in any substantial way, but that was almost besides the point. Everett had taken up residence, more or less, outside Stud Muffin, our local pastry shop, which showed a good deal of intelligence on his part. People grabbing a quick snack or a coffee, would be around to provide him with spare change, and Jenny Webb, owner of the establishment, might occasionally sneak him a day-old product or two. Even now, with the Stud Muffin still a little shabbier than usual since what we call “the storm,” aka Hurricane Sandy, it wasn’t unusual to see Everett, in his Mount Vesuvius of clothing and with shoes worn through in the soles, eating a raspberry filled croissant on any given morning. I’d just been leaving the shop with my best friend Jeannie when Everett had stopped me with his question. Jeannie had recently returned to work at Accurate Insurance (although why accuracy is the first quality one would look for in an insurance company eludes me) after her maternity leave was up, and her son Oliver was now spending time with a nanny named Louise—whom Jeannie had hired after an exhaustive search that made the vetting process of a Supreme Court justice seem like answering an ad on Craigslist. Jeannie is a, let’s say, hands-on kind of mom. “I guess so,” I told him. I gave Jeannie a glance and reached into my overstuffed tote bag for my wallet, then took out a five dollar bill to give to Everett. Jeannie did the same. “What kind of help?” I asked. I held onto the money in case Everett changed his mind. “Ghost help,” he insisted. Jeannie, to my left, stifled a snicker. She doesn’t believe in ghosts, especially not the ones in my house. Jeannie has seen objects fly by her face, holes inexplicably open in walls, watched her best friend (me), my mother, daughter, and Jeannie’s own husband Tony all hold conversations with the local spirits, and still she refuses to acknowledge their reality. Her complete denial is something I love about her. Jeannie is very persistent. Some would say stubborn, but not me. “What do you mean, ghost help?” she asked Everett, clearly amused by the whole conversation. Everett, who never used the bench outside Stud Muffin (“That’s for paying customers,” he would say), gestured toward it, beckoning us to sit down. But we were on a tight schedule—Jeannie had to get back to her job after this quick lunch break, and I had to get back to the guesthouse to greet newcomers this afternoon—so we chose to remain standing. I’ve been able to see some—not all—ghosts ever since a head injury after I bought the guesthouse, so I immediately looked around to scout the area. There were some ghosts nearby on Ocean Avenue, but that’s not unusual. Nothing looked threatening—I could see an elderly couple hovering on a bench half a block down, a policeman from about 1950, judging from his uniform, who appeared to be patrolling his beat a foot above the pavement, and a small tabby cat that was just lying around, albeit with nothing holding him up. He stretched and looked bored. Jeannie gave me a look that indicated she thought I was patronizing the unfortunate mentally ill man, but I curled my lip and sneered at her—a talent I’d been cultivating for exactly this purpose—and turned my attention back to Everett. “Been getting vibes,” he said. “Been hearing people say things.” That was it? Everett looked surprised, as if I should have known. “Make them stop,” he said. Simple. “If I could do that…” I started to say. It was a knee-jerk reaction. Sometimes having ghosts in the house is not as much fun as you might think. I’d bought the Victorian at 123 Seafront Avenue specifically to turn it into a guesthouse (and no, it’s not a bed and breakfast, although I’d started providing coffee and tea in the mornings lately, and had been thinking about asking my mother for cooking lessons) less than three years earlier. While I was doing the necessary repairs and renovations, I got hit in the head with a bucket of wall compound, and when I recovered, I could see there were two ghosts in the property I’d just bought. Paul Harrison had been a fledgling private detective in his thirties when he died. He’d been hired on to protect Maxie Malone, a 28-year-old newly minted interior designer. The protection hadn’t worked out that well, though, as both Paul and Maxie were poisoned the day after he was hired, and they both died in what, almost a year later, became my house. They were stuck on the property, and if I wanted to keep the building I’d just sunk my entire life savings, my divorce settlement and the receipts from a lawsuit I’d settled (never mind) into, I was stuck with them. Paul wasn’t bad company—he’s a thoughtful, considerate man who might have appealed to me in other ways if he’d been, you know, alive—but Maxie … well, my mother says she has “good intentions.” Perhaps. Maxie also likes to drive me insane, and ever since she’s gained the ability to move around outside my property (which Paul still can’t do), she’s almost inescapable. All in all, I can’t say I was always crazy about having ghosts in the house. My mother and my daughter, Melissa, however, were very pleased; it turned out that they’d had the ability to see and hear ghosts all their lives and hadn’t mentioned that little detail for fear of “upsetting” me (to be fair, it would have sent me into therapy). They still see more ghosts than I do, and there are days I wished they were still the only ones in the family with the “skill” to do so. “I don’t know how to make your ghosts go away,” I told Everett. “But if you take this five dollars, you can go inside and Jenny will give you some soup.” I extended the money again. Everett gave me a disdainful look. “I don’t think soup is going to keep the ghosts away,” he said. He took the money, though, and shuffled off, mumbling to himself that even the ghost lady wasn’t going to help. I didn’t have time to explain, though, because once he moved, I noticed that Kerin Murphy had been standing behind him, no doubt listening in on our conversation. I’d heard Kerin, who had once been a queen bee in the Harbor Haven PTSO (Parent Teacher Student Organization, and no, it’s not the PTA), had returned to town after an absence of more than a year, following a separation from her husband. It was rumored she’d fled Harbor Haven for South Florida and a waitress job at an IHOP, but this was the first time I’d laid eyes on her since her resurfacing. She gave me a hollow smile and approached. “The sharks are circling,” Jeannie muttered under her breath. “Compared to what?” Jeannie was still close enough to me that I could hear her murmur, but Kerin was oblivious. Kerin twisted her face into an expression she must have thought looked contemplative, but came out sort of constipated. “It’s been a trial,” she answered. “But I think we’re through the rough spots now.” The “rough spots” presumably included Kerin’s husband and all of Harbor Haven finding out about her affair with a real estate mogul. For this, I was fairly sure, Kerin blamed me. I’d been the one who’d discovered the truth while investigating Paul and Maxie’s murders, but it wasn’t my fault that everyone else in town had found out. I don’t run the local newspaper. I just have a good friend who does. “Yes,” Kerin said flatly. She didn’t need to be nice to Jeannie because Jeannie lived in Lavallette, not Harbor Haven, and her son Oliver, still less than a year old, would probably never attend the Harbor Haven school system. Therefore Jeannie, in Kerin’s world, didn’t exist. “I feel exactly the same way,” Jeannie said, taking Kerin’s hand in hers. I flashed a look at Jeannie that had the sort of language only very close friends can exchange without fear of retribution, and she let go of Kerin’s hand. “Well, we should be moving on,” I said pleasantly. Sort of pleasantly. I’m pretty sure I didn’t actually gnash my teeth. Jeannie’s eyes narrowed, but she knows I don’t let her off her leash unless I think I can’t handle the situation myself. “You were listening to our conversation?” I asked, just to buy a little time and try to figure Kerin’s motives. “Well, I didn’t mean to eavesdrop,” she said, affronted at the very notion. Clearly, this was my fault. “But I was right there.” She pointed to where she had stood, perhaps in an attempt to prove she’d been there. Jeannie made a sound like “pfwah,” which indicated that she considered Kerin’s comment something other than brilliant. 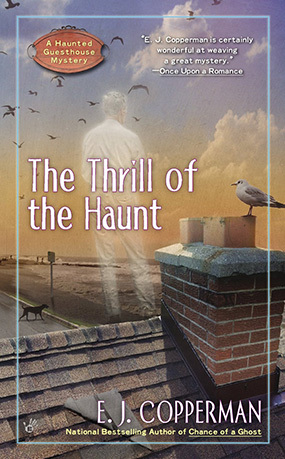 Kerin had witnessed actual ghostly behavior at my house, and had gone around telling many people in town what she’d seen. Rumors had always circulated about my house being haunted, but everybody sort of believed that in the abstract. Kerin’s assertions had been dismissed as the lunatic ravings of a vengeful mind. Because that was more fun. “You don’t really buy all that stuff, do you?” Jeannie asked. Kerin narrowed her eyes. “Of course,” she said. “Well, I’ll see you around town, Alison.” She turned and walked away without acknowledging Jeannie again. Jeannie shook her head as she watched Kerin turn the corner and disappear. “People in this town are awfully protective of that homeless guy,” she said. See, the ghosts are sort of an asset to my business, in a strange way. (As if they could be an asset in anything but a strange way.) Just before I opened for guests, I was contacted by a company called Senior Plus Tours, which provides vacation experiences with a little something extra to people over a certain age. Someone at the tour company had heard tales of spooky happenings at 123 Seafront—in part because word had gotten to them of the shenanigans the night Kerin was there—and offered me a deal: Senior Plus Tours would guarantee a certain number of guests per season as long as I could assure them there would be ghostly “interactions” at least twice a day. So I took the proposal to Paul, easily the more approachable of the two dead people in my house, and he’d agreed that he and Maxie—who took some persuading—would put on “spook shows” twice a day and cooperate at other times with the guests so I could start my business with a boost. But Paul wanted something in return. He’d been just getting started as an investigator when his life had been cut short, and he had loved the work. He wanted to “keep a hand in it,” and in order to take on the occasional investigation, he needed a partner (or as Paul puts it, “an operative”) who had the advantage of still being able to breathe. He also needed someone who could leave the house and its surrounding property, since Paul was unable to do so. In other words, he needed me. I had agreed, probably without thinking about it hard enough, to train for and receive a private investigator license, which I kept in my wallet mainly to impress the supermarket checkout “yenta lady” who loves to ask about everyone’s business. I had never intended to actually put the license to use, but Paul other ideas. So once in a while, when Paul conjures up what is usually an already dead client, I do the legwork on an investigation and let Paul do the thinking. I know that seems backward—I should be the one out of harm’s way, since nothing more can happen to Paul—but circumstances force us into illogical situations. “People will just believe anything they hear, won’t they?” Jeannie asked, bringing me out of my reverie. Oh, yeah. Walking back to Jeannie’s car. Right. “Anything they think is fun,” I agreed. Jeannie chuckled. “It sounded like you said you had new crew of ghosts on the way,” she said, getting into the van. I waved her off and turned to head back to my vintage (that is, falling-apart) Volvo. A new crew of ghosts? Bite your tongue, Jeannie.